The Internet Industry is flourishing through marketing and blogging efforts. New affiliate programs and CPA offers are launched for publishers introduced daily. In fact, one of the primary sources of income for them is through affiliate marketing and networking. Talking about the ad networks, affiliate & CPA networks are the ones setting the trends. One such great CPA affiliate network is admitad which I’ve been using for a while. admitad is currently among the most profitable affiliate networks that have been serving the publishers and the affiliate community for about seven years now. Let us have a deep insight about this CPA affiliate network and learn how you can benefit it. 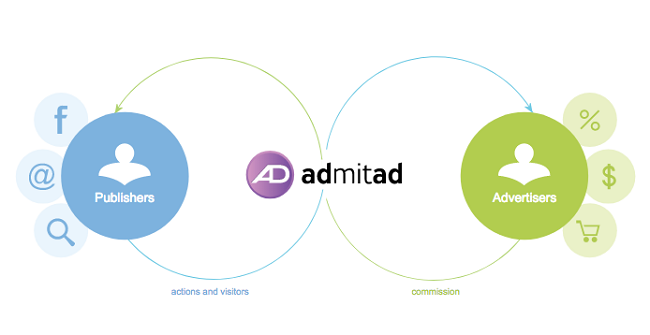 Unlike other standard networks, admitad came into the market and took it by the storm with multiple business models for both publishers and the advertisers. What is admitad CPA Affiliate Network? admitad offers Cost-Per-Action (CPA) affiliate programs, where advertisers get new reliable sources for sales and user engagements and publishers with new business models to monetize traffic on the site. admitad connects hundreds of thousands of satisfied customers across Europe. With their headquarters set up in Heilbronn, Germany, this affiliate network has already set up its branches in 7 different offices across the globe and expands to grow further. With partnering the biggest giants like Nike, Booking.com, Adidas, Citibank and much more, the network is a show stealer for the publishers. As of now, admitad has been providing the solutions for the success of more than 550, 000 publishers and 1300 advertisers around the globe. As an advertiser, this leading CPA network marketplace offers you more than 4,000,000 clicks in every 24 hours. Authentic publishers and reliable platforms should be the priority for you to work with admitad whose traffic sources are acceptable to you. Regular meetings are also arranged for top marketers and publishers so that customers can cherish the better relationship among the network users. For the publishers, the enormous range of affiliate programs allows you to select the most suitable one for your niche. The network is not limited to incomes only, and each model offers its unique rewards which you can claim after becoming a leading publisher. Many useful tools like Ad Server, URL, ReTag, SubID, Postback discounts and promo codes are available at every publisher's disposal. As an admitad publisher, you may quickly boost your conversion rate and unlock statistical insights to increase the overall profit for your website/blog. And the advertisers, in their turn, have an opportunity to gain more exposure for their brand. With admitad, Advertisers are entitled to have access to additional revenue around the world, gain new customers and pay for authentic results only. This largest CPA network opens up an additional international sales channel to agencies and new potential customers and users. Moreover, it offers publishers innovative products and global services using their website's traffic. Whether you're a publisher or an advertiser looking to promote your brand, admitad serves both efficiently. So, let's take a deeper look at what admitad offers for us. Earn money by purchases, application or sign-up with affiliate programs and ads published on your website/blog. Become a leading publisher and make hundreds of dollars by using your assets like high conversion rate and attractive advertiser deals. admitad offers a dedicated dashboard for analytics. Track active traffic channels, improve conversion rate and boosting revenue. Access to multiple tools like SubID, reTag, etc. Export the reports into XML and XLS file formats for detailed and thorough research to grow your traffic more by the statistics, as affiliate marketing is strictly driven by statistics. 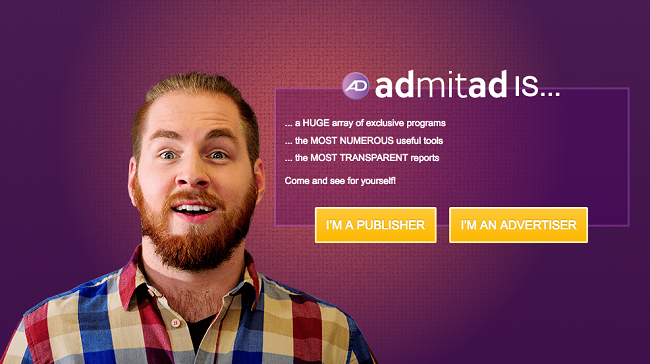 admitad always goes out to build relationships with promising, leading publishers. If you can relate to this sentence, then this affiliate network is definitely for you. Regular payments: admitad offers regular payments on a weekly basis of your commissions in all major currencies using the standard transaction methods like PayPal, Web Money, Wire transfers, and much more. Most interesting part, admitad minimum payout is just $10. At present, there are more than 1,300 different affiliate programs to choose. admitad houses an enormous range of CPA affiliate programs means that you can find one perfect for your traffic profile or your niche. By now, most of you must have caught a glimpse of how really effective is this network. So, if you think that it is the time that you should start monetizing your website/blog with admitad, then here's a pretty great campaign, to begin. Whether you’re a brand new advertiser looking for ways to increase your brand’s exposure or an owner or publisher of a popular website/blog, admitad helps both the people in different ways. Since you’re starting up with this remarkable CPA affiliate network, we’ll walk you through the signup process and how to start making the most out affiliate marketing. Sign up with admitad is just like taking chocolate from a kid’s hand. 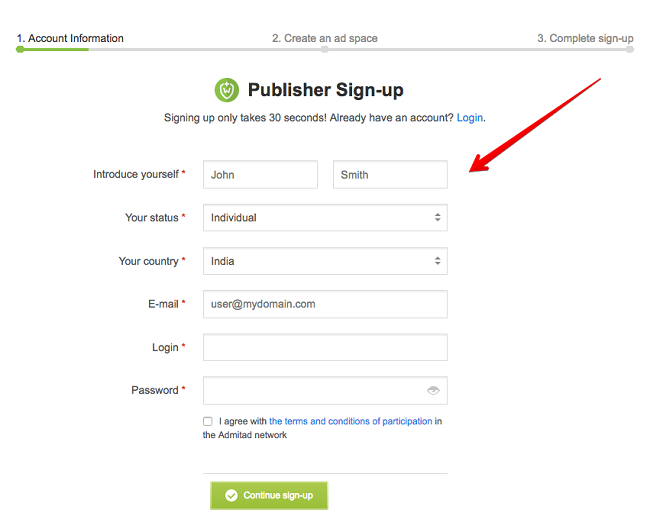 Within 30 seconds or so, you’ll be easily able to register yourself on the network, as an Advertiser or a Publisher. Just fill in your personal details like your Name, whom you’re representing, Country, Email Address and credentials for a Publishers Account. After this, the admitad network sends you a confirmation email to verify and guide to the next process. Moreover, the signing up for an Advertiser is not as similar. You are also required to mention the website to you want to advertise, Contact Details, Industry Category, and whether you’re using other CPA networks or any affiliate program or not. That’s It. So, why are you still waiting? Go ahead and join the admitad network which is the leading CPA affiliate network for publishers as well as advertisers. This was my take on admitad. Do share your thoughts and let me know if you're going to sign-up for this network or not in the comment section. The registration process is simple and only requires your basic personal details, publishing platform, and you're all set to rock!